About three months ago I began working as a volunteer on a community gardening project close to where I live. Situated on the edge of Worcester racecourse, the Old North Stables Teaching and Display Garden was set up to provide an opportunity for people to learn sustainable gardening practices and to share knowledge and skills. By the time I joined the project, a number of volunteers had worked hard to turn an overgrown and abandoned stable block into a viable and vibrant garden, with bee hives, different varieties of apple trees, a polytunnel (now brimming with tomatoes, peppers, tomatillos and chillies) and raised beds full of vegetables, fruit and herbs. Worcester is a relatively small city straddling the river Severn in the UK’s rural south west midlands. The city is prone to flooding, and whenever the river bursts its banks the racecourse acts as a natural flood plain. This means that periodically the Old North Stables gardens are also at risk of flooding. For that reason, most of its produce is grown in sturdy raised beds. Its beehives have been ingeniously attached to a floating pontoon, which is itself secured in place by vertical scaffolding poles, so that when the floods do come, the hives will rise safely and majestically above them. I only work there for two hours each Saturday morning, but for me the community gardens at Old North Stables is an oasis. I love being part of a project based upon the spirit of sharing and cooperation. People come here to learn about growing their own food, to interact with others and to learn about themselves too. Paul Snookes, who gave up his job as a university lecturer to work virtually full time at Old North Stables, is like the heartbeat of this wonderful project, and the man who back in May inspired me to put myself forward as a volunteer. He once, memorably, said to me, “we grow people here, as well as plants”. The founder of the project is another inspirational individual, Tony Kennell, who is also chair of Transition Worcester. Tony is actively involved in a range of other community-oriented activities including orchard restoration and gleaning (harvesting unwanted surplus fruit and vegetables from farms to pass on to those in need). His intention with Old North Stables was “to create a teaching and display garden, where people of all ages, with any level of experience and any degree of ability can meet, practice gardening, gain new insight into sustainable living and actively cooperate towards creating a happier, fairer and stronger community”. That’s a philosophy that resonates in my heart, and it’s great being part of such a pro-active project, showing people what wonderful things we can do – and be – when we pull together. The Old North Stables is always open to the public, but last Saturday was a non-working day because we held a barbecue instead. It turned out to be a lively, sun-drenched afternoon of celebration, attended by about fifty people. I had cooked a number of dishes for the event using produce from the Old North Stables community garden, as well as from my own allotment, the Circus Garden. Alongside a big pot of Thai pumpkin and coconut soup and some beetroot, chickpea and bean burgers, I made some heritage tomato pizzas using a variety of tomatoes including buffalo horn, orange bourgoin, Ukranian purple and red alert. Frying the pizza base in olive oil is the traditional way to make pizza fritta , a street food classic from Naples. It gives the base a beautifully light and crisp texture. The addition of fresh basil pesto perfectly complements these beautiful tomatoes. For a vegan version of this dish, omit the Parmesan from the pesto and use a vegan Mozzarella cheese on the topping. 1. First make the dough for the pizza base. Place the dried yeast in the lukewarm water and stir. Leave for 5 minutes. Put the flour in a mixing bowl and add the salt. Pour in the olive oil and the yeast mixture. Mix into a ball of dough and knead for 10 minutes until it has become smooth and pliable. Lightly rub with olive oil and put in a bowl. Leave to prove for an hour, with a clean tea cloth or some cling film over the bowl. 2. In the meantime, make a thick pesto sauce by blitzing the basil, garlic, olive oil and Parmesan in a blender. 3. Pre heat the oven to 230 °C (450°F, gas mark 8). Mix 1 tablespoon of the pesto with the tomato puree and passata. Set to one side. 4. Punch down the pizza dough and roll out into a thin circle. Pour the 4 tbsp olive oil into a frying pan large enough to accommodate the pizza base. Place the pan over a medium heat and when the oil is hot add the pizza base. Cook for 2-3 minutes until the base is hard and slightly coloured then turn over and cook the other side similarly. Drain on kitchen paper. 7. Halve the smaller tomatoes and slice the bigger ones. To assemble the pizza, thinly spread the puree, passata and pesto mixture over the pizza base. Scatter the mozarella over the base, then add the basil leaves. Finally, arrange the tomatoes over the top. Place the pizza in the pre-heated oven for 5-10 minutes or until the crust is golden brown and the cheese is bubbling. Remove from the oven, drizzle over the remaining pesto sauce and serve. What a wonderful garden and great philosophy behind it. Such an ingenious idea for the beehives too! Such an appealing pizza image 🙂 And thank you for introducing me to frying the pizza base – must give it a go! 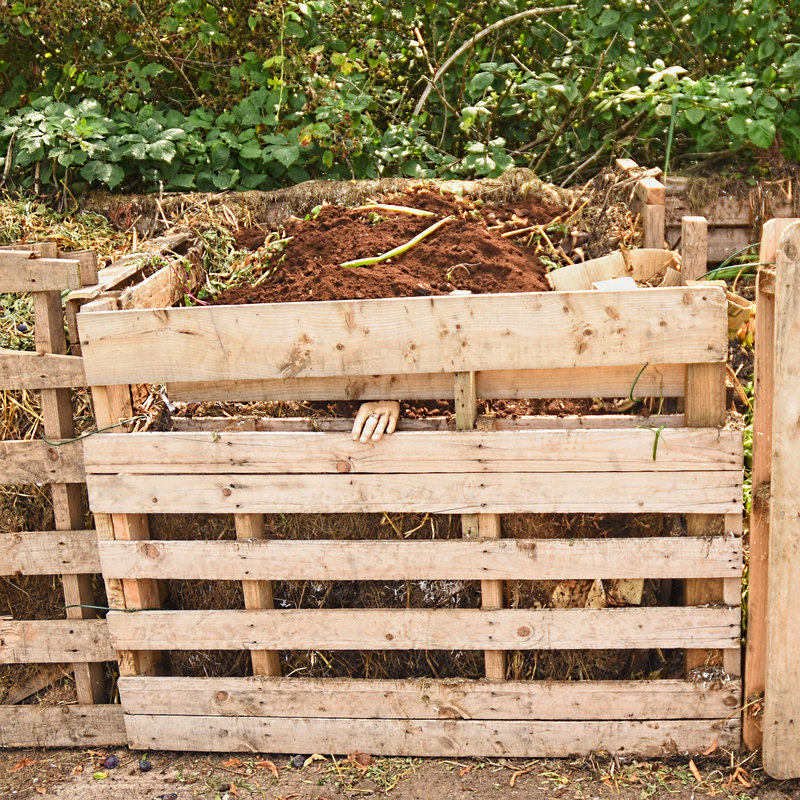 Curious if you have an explanation for the human hand peaking out from the compost box. Is this what you meant by “we grow people” ? I also have a body thats just eating up space in the freezer. I would love to put him to good use. Please inform. Thanks again for the great pizza images. Very inspiring.